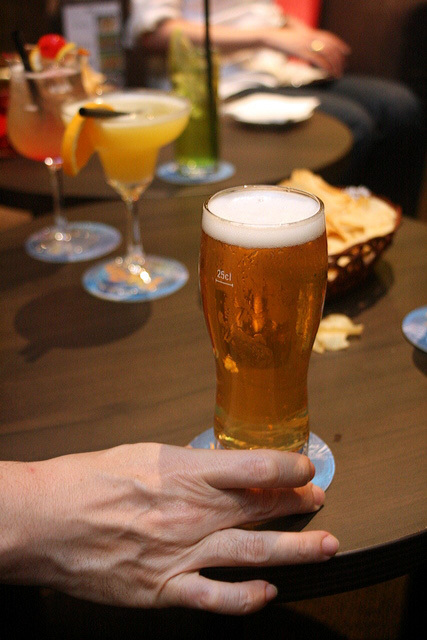 Yes, let's continue with our bar-hopping adventure at Changi Airport that began with dinner and drinks at Hard Rock Cafe. We covered seven locations across three terminals (inside departure and transit area)...and we have some 26 drinks to show you. Obviously, I do not recommend you imbibe all of them in one sitting. But it's good to know you won't be short of options after checking in or during a layover. 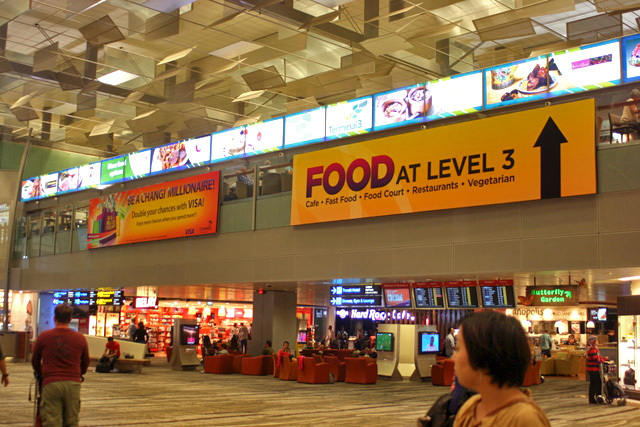 There are more than 100 F&B outlets at Changi Airport. Have I told you I love the airport? 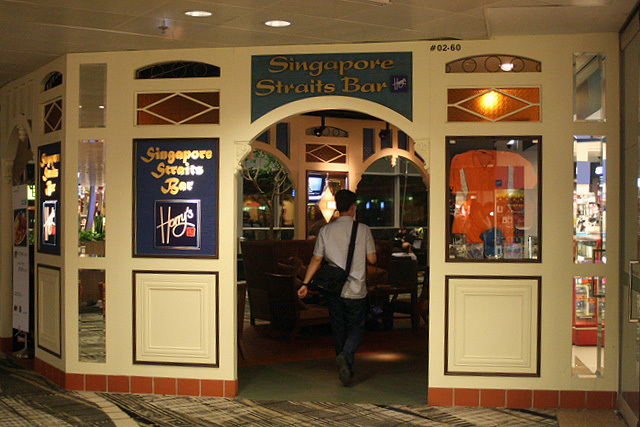 After dinner, we dropped by the Singapore Straits Bar at Terminal 3. It's near the Hard Rock Cafe. The bar is a cosy place with pool table and live band. As it's owned by Harry's Bar, the drink menu is pretty much the same. You probably are familiar with Harry's - they are everywhere. And yes, there is a Harry's Bar at Changi Airport too, at Terminal 1. The setting is the lovely Cactus Garden, which features over 40 species from all over the world, including exotic blooms and prehistoric Cycads. 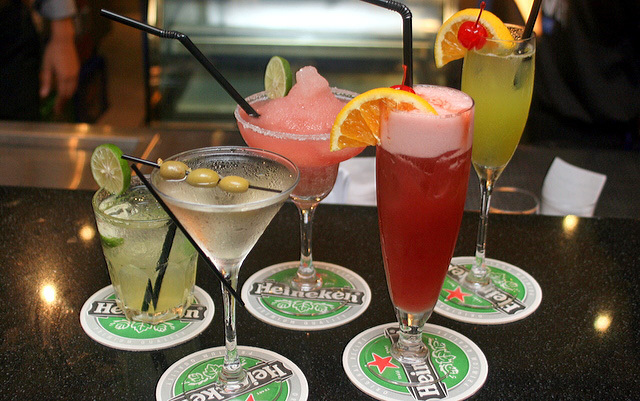 This is the line-up we had at Harry's Bar (L-R): Dirty Harry, Dry Martini, Margarita, Singapore Sling, Jungle Juice. We liked Jungle Juice a lot - a winning blend of banana liquer, Malibu, Midori melon liquer, lime juice and pineapple juice. The bartender also mixed for us a special Cointreaupolitan (first photo above). It's Cointreau, cranberry and lime, flavoured with a slice of orange peel that the bartender set aflame briefly to release the citrusy aromatic oil. Changi Airport seems to have everything. 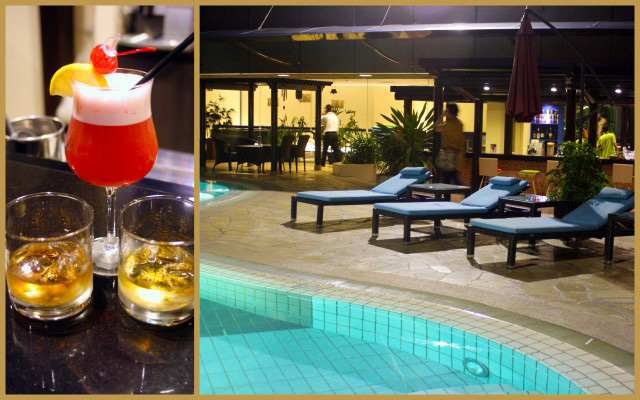 There is a swimming pool in the transit hotel at Terminal 1, and you can pop in for a drink beside the cool waters. It's free entry even if you are not a hotel guest; you only pay to use the pool (S$13.91 nett per person, includes one drink). They have a very sweet Singapore Sling here, along with stiffer drinks like Johnny Walker Black Label and brandy. 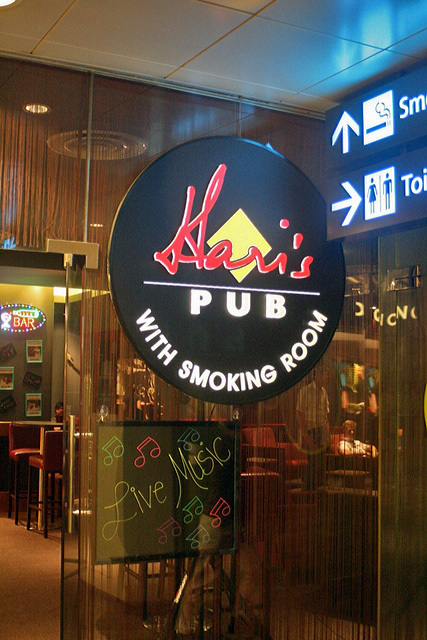 Over at Terminal 2, there's Hari's Pub or Bar, not to be confused with Harry's Bar. It's tucked away at the back. Smokers will probably find relief here too, given the smoking room. The house beer is surprisingly delicious! It almost tastes like honey, really smooth and easy on the palate. Drinks from Hari's Pub (L-R): Limelight, Fuzzy Navel, House Beer, Negroni, Green Ice. The Negroni is quite strong, but it also comes in a "lighter" version mixed with soda. Green Ice is pretty nice. But the beer still reigns. 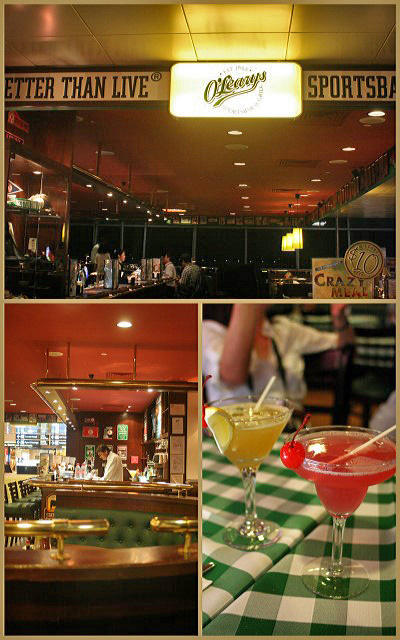 Not too far away is O'Learys Sports Bar, where you can drink and dine surrounded by sports memorabilia and TV screens. There is also an O'Learys at the Singapore Flyer, I believe. 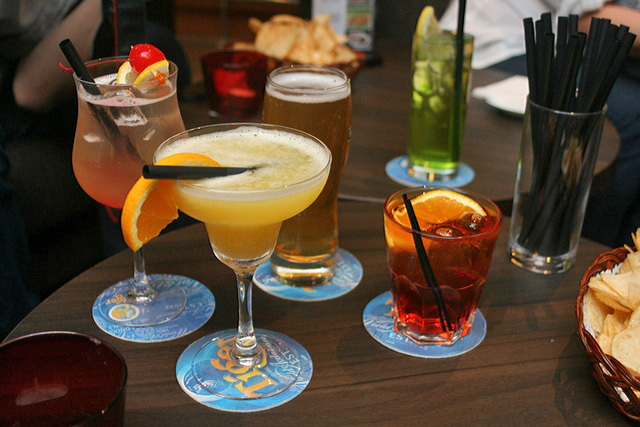 Food is always a good idea with drinks. 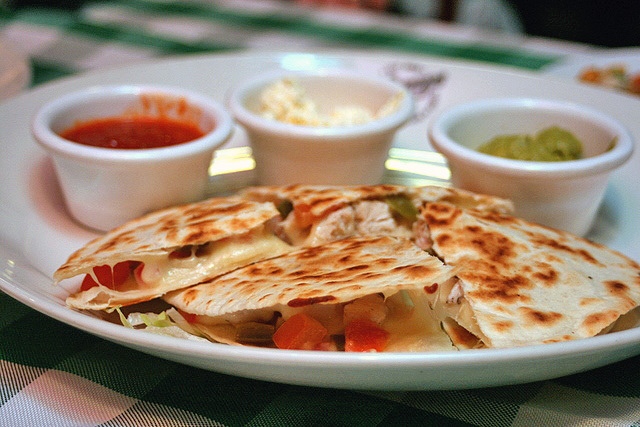 We went for their signature chicken quesadillas to line the tummy. 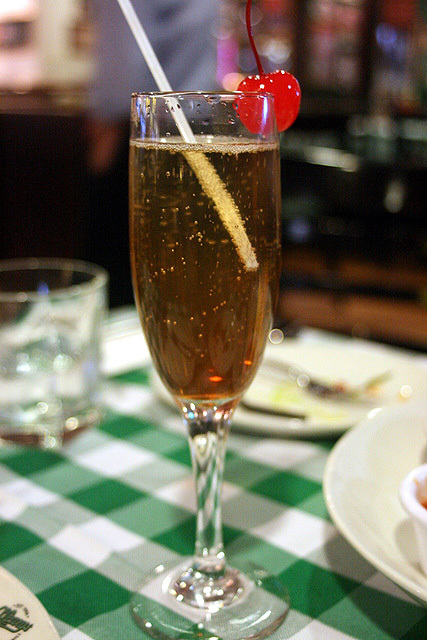 Kir Royale at O'Learys. 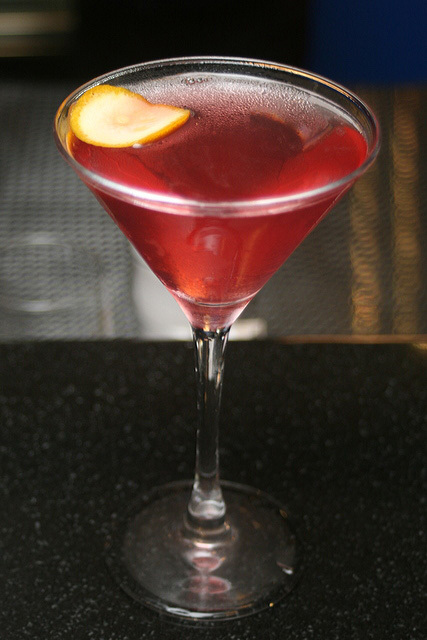 Cassis-spiked champagne. 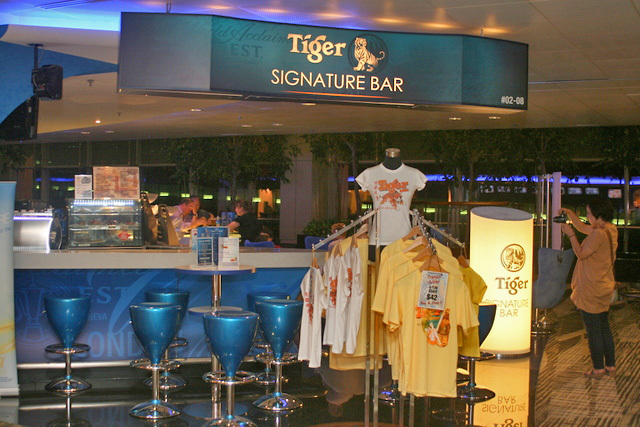 The last stop is the Tiger Signature Bar and Lounge at Terminal 2. Clever of Tiger to set up here and give an international audience a taste of Singapore brew. 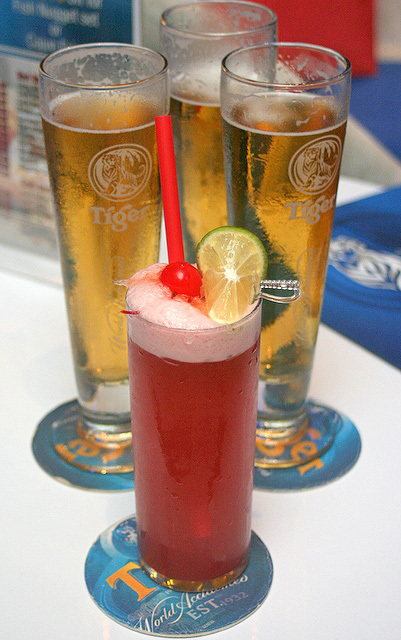 Tiger Crystal and their version of the Singapore Sling, which the bar claims is close to the original. More food. Drinking is a good excuse to eat greasy food! 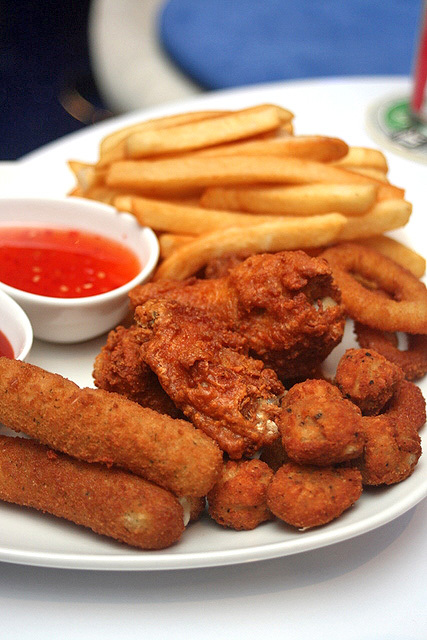 Mixed Platter: Cheese sticks, chicken wings, fries and onion rings (or were they calamari? By this time all is fuzzy). 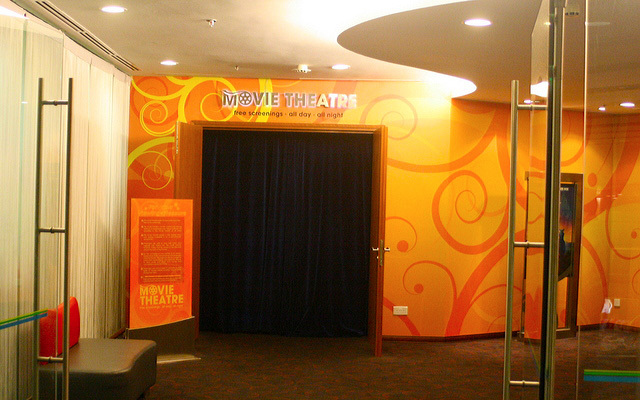 Besides bars, there are plenty of leisure and entertainment options. 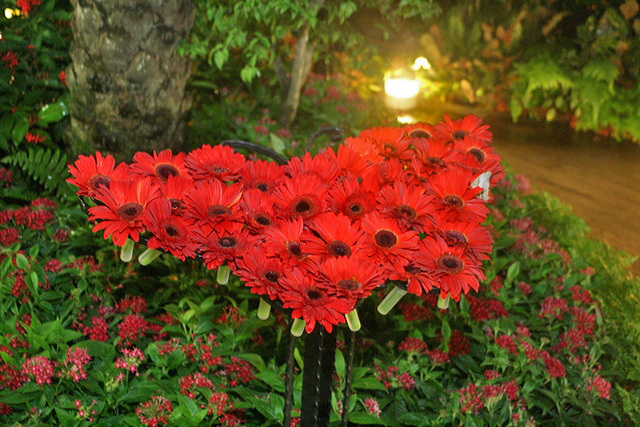 Changi Airport is also lush with nature. In addition to the Cactus Garden, there is a Fern Garden, Orchid Garden and interestingly, a Butterfly Garden (a world's first) at Terminal 3, which even has a 6m waterfall. The lifespan of butterflies is really short - just a few days, so pupae are brought in from Penang regularly. You can even view these pupae and see the butterflies emerge. And while you eat and drink, feed your phone some juice too. Little lockers with chargers - what life-savers! Especially if you haven't tweaked your new iPhone 4S to not drain its charge so quickly. Incidentally, November 2011's theme for Fabulous Fridays at Changi Airport is liquor. 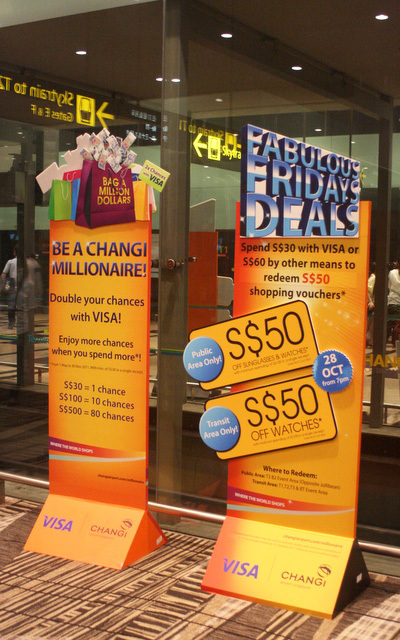 Spend a minimum of S$30 by VISA or S$60 by any other means, and enjoy the featured product of the week at a special rate - up to 90% off! Plus the Millionaire Draw is back. Enjoy it all - I'm sure you guys know how to drink responsibly. Update: for an even more detailed account, check out Keropokman's post! 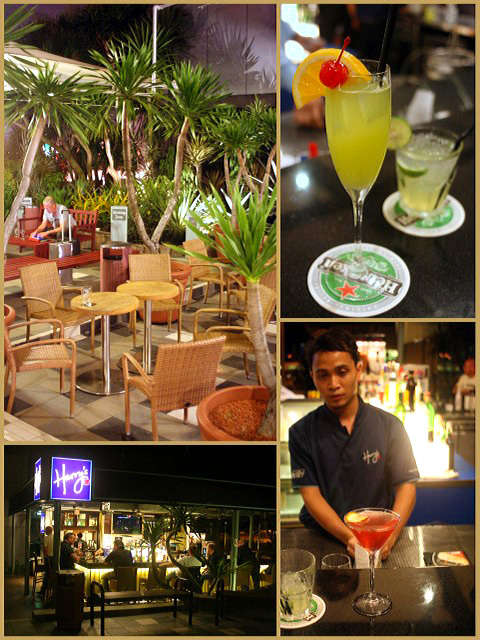 Many thanks to Mandy and Jonas of Changi Airport for hosting us on this epic bar-hopping journey! certainty did not know that there's free charging and even a movie theatre! amazing! 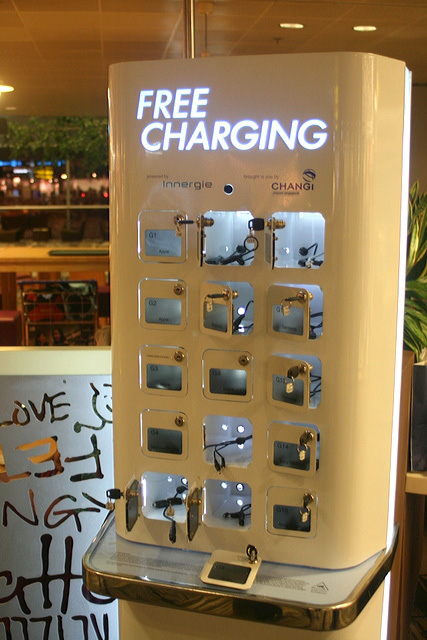 Yes, FoodieFC, free charging but I notice the iPhone docks were all full! And free movies...they have a clock inside, so you don't miss your flight! Miso: Yeah, we have a great airport, seriously.